There are rituals in knitting. At least there are rituals for me. Small ones — a bit of magic, a little thought, some small comfort. It’s the same and different for all of us. One of mine is the stitch marker. Which tiny anchor will I choose as I begin to knit? If it will serve to signal the beginning of a round, then it must be the right one, the perfect thing to catch my eye as I come to it, then slip it from left needle to right as I move around the circle. It is where I begin and end a piece of the pattern, where I stop to check the instructions or the chart. It is where I hurry to if I’m excited, or what I look longingly at if I’m slogging across hundreds of stitches. If I need markers to help me count or space the pattern, then I have dozens to choose from. But that first one, the one for the beginning, must be chosen with care. It might have sentiment attached, or it might be practical. It might just “go” with the yarn. But I always choose it carefully, because even small rituals matter. Even tiny anchors have a place. 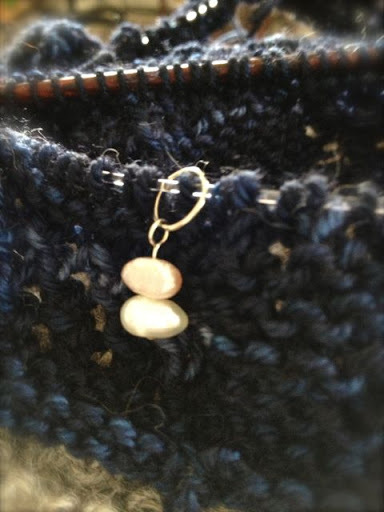 Do you have a favorite stitch marker, or a small knitting ritual? Sorry; for me, markers are purely utilitarian. I've had a couple of decorative ones given to me — by non-knitters. Long and lovely, but they caught on the fabric and got in the way. I prefer the wee "O" rings in rubber. They're neat and tidy, and soft enough they don't bother my fingers as I knit past.A knitter for over 50 years, I'm not certain I have any rituals…just that knitting in some way, shape or form is part of almost every day. Those are my go-to markers, Margaret — I have so many, it doesn't matter if one pops off and flies across the room, never to be seen again. But at the beginning, I love a not-too-fancy marker. I too love to have a special 'begin the round' marker. It has to be something pretty–everything else in the project can be the utilitarian o ring.